My husband and I have been going dancing a couple of times per week since moving to Portland. We've been dancing with a great bunch of waltz nerds, Waltz Eclectic. We've been taking lessons and plan to take some more. Tonight was the end of summer season dance in Laurelhurst Park complete with proper dance floor, lighting, fancy deserts, full moon, everything! 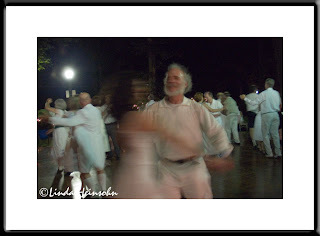 I love this photo because it reflects the ebullient spirit of this kind of rotary waltzing. I also like the swirl of movement my camera caught on a purposely slowed exposure. I braced my camera on a lamp post.